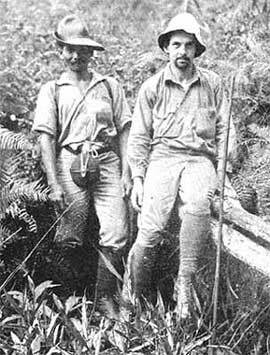 At an age of 23 years old Ernst Mayr, a young ornithologist, was asked by Lord Rothschild (Zoological Museum in Tring), to go on a zoological expedition to New Guinea. The unexperienced explorer stayed for six months in Dutch New Guinea and visited the Arfak Mountains on the Birdshead Peninsula, Wandammen Peninsula and the Cyclop Mountains. Being an ornithologist he collected, of course, mainly birds, but also plants and insects. His insect collection is now at the British Museum in London (BMNH). A detailed report can be found in the Natural History Magazine of January-February 1932.